In cross country, seventeen Millfield runners across all year groups raced for Somerset at the English Schools Finals at Temple Newsom in Leeds. In the Senior Girls’, Upper Sixth Elise Thorner finished in 6th place from 340 competitors, with Lower Sixth Millie Wills finishing in 29th place. In the Senior Boys’, Lower Sixth Niall Caley finished 75th out of 350 runners. In the Junior Girls’, Year 11 Daisey Pellow finished 61st out of 340 runners. In the Intermediate Girls’, Year 11 Poppy Pellow finished 11th and Year 10 Sophia Wilson finished 120th out of 340 runners. In dance, over 70 pupils from all year groups performed a range of dance styles in this year’s Wonderland themed Dance Show. All six Upper Sixth dancers (Elenice Andrews, Ellie Guthrie, Sofia Hinteregger, Aria Kalmar, Alice Kramer and Izzie Spencer-Shellard) showcased their own pieces which ranged in style from Jazz to Contemporary. Year 10 Barney French was commendable in his work in lighting and sound. In fencing, Millfield fencers took part in the British Schools Team Championships and the Public Schools Fencing Championships – the oldest and largest event in the country. At the British Schools Team Championships, Millfield were British Champions in the following: Under 18 Boys Foil, Epee, Under 18 Girls Foil, Sabre, Under 15 Boys Foil, Under 15 Girls Foil, Epee, Sabre and Under 13 Girls Sabre. Millfield were runners up in Under 15 Girls Sabre and Under 11 Girls Sabre, and Millfield won bronze in Under 18 Boys Sabre, Under 18 Girls Epee, Under 13 Boys Sabre and Under 11 Boys Epee. At the Public Schools Fencing Championships, Millfield were the overall Champions for the 8th consecutive year. In the Boys’ and Girls’ Under 18 Epee, Jacob Mitchell finished 3rd and Lower Sixth Alice Sismanovic placed 5th, respectively. In the Girls’ Under 16 Epee, Year 10 Elena Launder placed 3rd with Year 10 Olivia Mahony 7th. In the Boys’ and Girls’ Under 16 Sabre Year 10 Ben King-Sanders finished 8th, with Year 10 Antonia Finkenstaedt and Year 10 Kelsey Woname both placing 3rd and Elena Launder 8th. In the Boys’ and Girls’ Under 14 Foil, Year 9 Alex Cupper finished 2nd and Year 9 Lauren Tang 3rd. In the Boys’ and Girls’ Under 14 Epee, Alex Cupper finished 3rd and Year 9 Sabrina Jones finished 3rd. In the Girls’ Under 14 Sabre, Year 9 Renee Nassozi-Kiggundu placed 5th and Year 9 Stella Gillespie placed 6th. In the Master/Champion-at-arms, there were 1st places in three categories: U18 Boys (Jacob Mitchell), U18 Girls (Becci Curwen and Evita Chan) and the U14 Boys (Alex Cupper). Millfield were champions in following categories: Girls Foil (all ages combined), Girls Epee (all ages combined), Under 18 Girls (all weapons), Under 16 Girls (all weapons), Under 14 Girls (all weapons), Most Improved Girls Squad, Overall Best Girls, Boys Foil (all ages combined), Boys Epee (all ages combined), Under 18 Boys (all weapons), Overall Best Boys and Overall Champions. 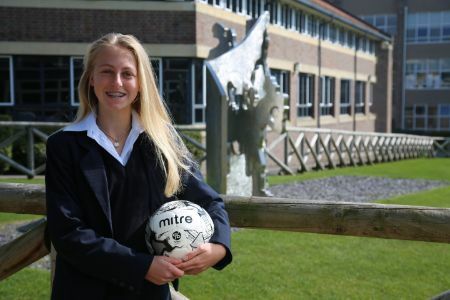 In football, Year 11 Millie Quaintance has been selected to play for England ISFA. Year 10 Clarissa Jackson played for England ISFA U16, winning 4-2 against Kent Schools. Year 9 Lauren Pickup has been selected to play for the Lionesses, the U15 England Ladies Football team, this coming Easter in Belgium. This will be Lauren’s first England Cap for the Lionesses. Lauren has also been signed with Chelsea Ladies FC for the past three years. The Millfield U16 girls have made it to the final of the Somerset County Cup. The 1st XI were runners up at the ISFA finals at MK Dons, narrowly defeated by Royal Russell, 2-1. Millfield will welcome 20 teams from around the country to compete in the Millfield Easter Football Tournament over the Easter Holidays, including Bristol City Academy, Exeter Academy, South London schools & Plymouth Academy, amongst others. In equestrian, Year 10 Anabelle Heffron has been selected to represent Ireland in show jumping at the U18 Nations Cup event in Belgium next month. In golf, a number of pupils were in action at the Somerset Schools Championship in Weston. Lower Sixth Charlie Goss was Boys Champion with a gross 69 (-1) playing off 3, with Lower Sixth Tom Peet finishing runner up with a gross 71. Lower Sixth Mimi Rhodes was Girls Champion with a gross 70 (-2) playing off +2. Runner up with gross 72 was Year 11 Ellie Lace who was the Girls nett winner, with Year 10 Jo Champion being runner up with nett 70.
Notable gross scores included Year 9 Freddie Turnell (72), and Lower Sixth pupils Sky Pinto and William O’Halloran with 75. Year 10 Michael McNee finished 3rd in the Boys nett. Charlie, Tom, Freddie, Mimi and Ellie now go forward to represent Millfield and Somerset in the South West Schools Championship in May. Year 9 Harriet Lockley and Lower Sixth Tom Peet were selected to play for Wales in an International against Ireland. Harriet won her foursomes match but lost her singles. Tom played two foursomes matches, winning one and losing the other. Lower Sixth Mimi Rhodes has been selected to represent England in the French U21 championships in France during Easter and is attending National coaching this weekend. Lower Sixth Charlie Goss represented the Somerset men’s team in a recent match against the Somerset PGA golf professionals. Year 10 Megan Langford represented Worcestershire in their recent match. In hockey, the boys U14A finished as runners up in the West Regional Competition. The U15A girls won the Independent Schools competition (ISHC) beating Kingston Grammar in the final 1-0. The 1st XI finished runners up in the England Hockey National Schools, losing to Repton 1-0. They also came 3rd in the Independent Schools competition (ISHC) beating Rugby School 4-3 in the 3rd/4th play-off match. In netball, the U19 team finished 4th at the National Schools Tournament. The U15 team won the Independent Schools Netball Cup, with the U19’s finishing runners up at the same event. In rugby, Upper Sixth pupil Josh Gillespie has signed a professional contract to join Northampton Saints in July 2019. A number of pupils have also received national call ups: Lower Sixth pupils Dan John and Oliver Burrows played for Wales U18 team against France, Lower Sixth Ewan Richards played for England U18s, winning against Scotland. Upper Sixth Tyler Olding has been called up to play for Wales U19 against Japan and has joined the Cardiff Blues Academy, and Upper Sixth Fergus Walker has been called up to England U18 England Counties for 2019 season. The 1st VII reached the quarter finals of the Surrey 7s, losing out to Dulwich College 14-22. The U16 VII won the Stowe 7s tournament, with U15 pupils Amir Sultan-Edwards, Max Jenkins, Felix Hamilton-Marino and Sam Harris receiving special mention for their performances. The Millfield U15s scored in the last play of the game to win against Beechen Cliff in the final of the Millfield 10 a-side U15 tournament. The U14s who won their first tournament of the year, remaining unbeaten throughout. Year 9 George Timmins was commended on his performance, as well as Year 10 U15 Ellis Baker. The U16 team won the All England 7s 22-21, playing eight games in quick succession and coming back from behind to win the tournament. In polo, Millfield White were winners of The Sandpool Trophy with the Blue team placed 3rd at the Druids Lodge end of season Schools Championships. In skiing, Millfield finished in 3rd place at the U18 Interschools Competition in Pila, Italy. Upper Sixth Charlie Leach placed 3rd for U18 GS races and 6th overall in the competition. In swimming, Millfield has qualified for the British Swimming Championships in Glasgow from the 16-21 April. The event will act as the qualification for the World Swimming Championships, World Junior Championships, the European Junior Championships and European Youth Olympic Festival. At the 50th National League Cup Final, Millfield Swimming finished 2nd. Millfield went into the day ranked 7th but moved up five places through grit and determination. Read more. Millfield took seven swimmers to the Edinburgh International Swim Meet, which saw the team achieve 34 season bests and eight best times. Millfield also hosted the TYR super series event, which brought 640 swimmers from across the country to the Millfield swimming pool. In shooting, Year 9 Patrick Salisbury and Year 11 Myles Cullen attended a selection day for the British Shooting Olympic Talent Pathway and were both accepted onto the programme. Myles was also part of the winning team at the Ling Shooting School Easter Challenge, as well as winning the High Gun trophy. The first Millfield Parent and Child competition took place at Millfield’s home ground, Mendip. Over 40 families took part, with the winning pairing of Year 11 Spencer Findlay and his uncle Paddy scoring 81/100. Millfield took two teams to the inaugural Independent Schools Clay Pigeon Championship hosted by Schools Notices at the Holland and Holland Shooting Ground in Northwood. The team, captained by Myles Cullen and comprising of Spencer Findlay, Year 10 Boris Findlay and Year 10 Harvey Higgins took a commendable 4th place. In squash, Millfield entered five teams in the National Schools Squash Finals, where the boys’ key stage 3 pupils from Millfield Prep and Millfield in Years 5-9 were national trophy winners. The girls’ key stage 5 pupils from Years 10-Upper Sixth also won the national trophy. Other results included the boys’ key stage 4 pupils from Years 5-10 placing as regional finalists, the girls’ key stage 4 pupils from Years 8-11 placed 5th nationally, and the boys’ key stage 5 pupils from Years 9-13 also placed 5th nationally. Four of the five teams played in Nottingham in the National Finals, with pupils from Millfield Prep and Millfield taking part.